Venezuela's President Nicolas Maduro attends an event with workers in Caracas, Nov. 14, 2017. 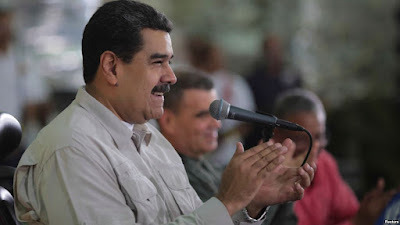 CARACAS, VENEZUELA — Venezuelan President Nicolas Maduro has called for an investigation into Roman Catholic priests he says have made comments critical of the government. Venezuela sits atop the world's largest oil reserves but is enduring an economic after nearly two decades of socialist rule. Maduro didn't directly name any priests. WNU Editor: No mercy for this opponent of the government .... ‘The order is to kill you,’ Venezuelan soldiers reportedly told rebel cop before firing (Miami Herald).